Welcome! I wrote two different intros–one for those unfamiliar with anchor cleaning (tends to be newer climbers) and those familiar with it. Thanks for checking this out! Cleaning a climbing anchor is one of the essentials skills you’ll need if you want to climb outside. “Cleaning” is a thing you do when you’ve been climbing a climb and you want to move on and go somewhere else. Most routes require you to use your own gear to climb it (quickdraws, trad gear), so to finish the climb, you have to get all your gear off of it and then get down. This means using the fixed anchor (typically bolts/hangers/rings attached to the rock at the top of the climb) to get down. Just so you’re aware, sometimes there isn’t a fixed anchor at the top (you might have to use a tree or something), but that’s a separate issue. There are two major ways to get your gear off the climb: threading the rope through the fixed gear and having your belayer lower you to the ground (this is what you do in climbing gyms) or you can thread the rope through the gear, pull it through so that both ends are on the ground, and then rappel to the ground. In this post, I’m going to describe each method and evaluate the safety of each. Thanks for checking this out! The whole “rappelling vs lowering” thing is super interesting. It’s only a small part of the entire climbing culture/lifestyle/process, but it can get people really fired up. The ethics of the sport speak to our morals much more than the actual climbing does, which is a testament to how passionate we are and how much it means to us. That’s really cool, no matter where you stand on the subject. That being said, I’ve realized there isn’t a good resource for the RvL issue online. There are forum posts that just add to the flame war, but there’s no breakdown of the methods and assessment of the risks. So I’ve attempted to create one. My goal here is to cut through the mess and get to the real differences about the two options (there’s actually three options since there are two lowering methods). So, I broke down the methods into their individual steps and compared them. Then, I removed either 1) steps that are the same in all three methods or 2) steps that do not add significant risk. What was left was the actual steps that contribute to major risks of the climber. Note the title–this is by no means a perfect science. But, even when I was going through the process of writing the post, I was surprised at how enlightening it was. Even if it’s not perfect, I hope it helps further the discussion and/or help new climbers understand the issue. One last point: to keep it simple, I’m just covering a reasonable use case scenario. This means it will cover 95% of situations, not special cases (ie, incredibly steep terrain or routes with weird traverses). I’m talking about straightforward, single-pitch routes for the climbing majority–5.6-5.12 climbs that run up terrain that is anywhere from slabby to gently overhanging. What are the risks of the different anchor cleaning methods? I’ll start out by listing the steps of each method below. I’m sure people will have their personal variations of each, but I think you’ll agree that these are fine distilled versions. In all cases, I’ve broken the process down into every individual step so we can look at each case in detail. 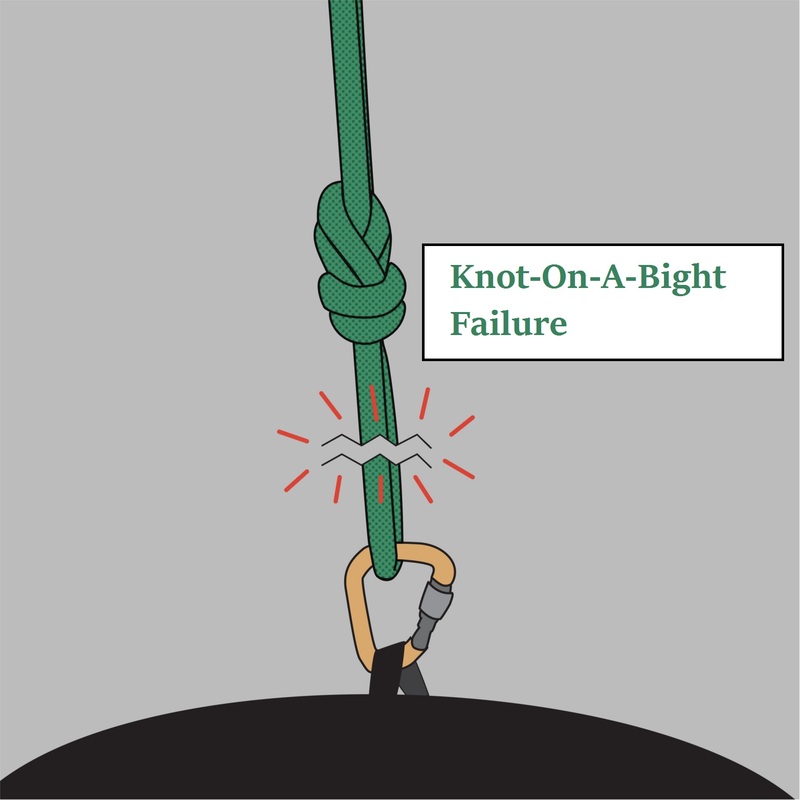 For lowering, there are two methods–the first is for an anchor that allows a bight of rope to pass through (rings, biners, etc), and the second is for one that doesn’t (small chains, if your rope is super fat, etc). In all cases, the steps start when you’ve finished the climb and reached the anchors. If you’re really interested in this discussion, read this part carefully, as it’s really important that I got this right to your satisfaction. For each method, I’ll first list the steps via bullet points, then I’ll show them via gifs, then I’ll embed a full youtube video. Climber pulls up a bight of slack. Climber threads bight of rope through anchor. Climber ties a figure-eight on the bight. Climber clips into the figure-eight w/ a biner. Climber says “Ready to lower!”. Belayer pulls slack out of system. Climber clips the figure-eight into their harness/the anchor. Climber threads end of rope through the anchors (untying rope from anchor/harness if needed). Belayer takes climber off belay. Climber pulls the rope until both ends are on the ground (or to the halfway point). Climber asks for/belayer gives fireman’s belay (optional). So, let’s evaluate. To do so, we’re going to look each step in the context of adding risk. When I mention a step, I’ll note where it came from using “#.#”, which means “Method.Step”, so “1.1” is the 1st step in Method 1, or “Climber clips in direct”. Okay that was easy. Now the comparison gets a little more subjective. I’ll remove what I think is reasonable and give details later if needed. First, let’s take out the steps that are insignificant in risk-adding. For example, we can assume that the simple steps of “Belayer pulls slack out of system” (1.8/2.9), “Belayer takes climber off belay” (3.3), and “Climber pulls the rope until both ends are on the ground (or to the halfway point)” (3.9) do not add risk. If there is a communication issue (which I’ll address later), these parts could be dangerous, but the physical actions themselves are not dangerous. Let’s also remove the “Threading the rope through the anchor” steps (1.3/2.6/3.8). You could thread it wrong somehow, but it’s basically the same step in all 3 cases, so it doesn’t add any more risk to one method. At this point, we’ve pretty much removed any fluff that doesn’t have a significant impact on the risk of each method. What remains are the major safety considerations. This makes sense because these are typically the talking points whenever someone discusses the pros/cons of each: “What if they tie their knot incorrectly?” or “What if they set up their rappel incorrectly?”. So, let’s identify some of the major risks for each. 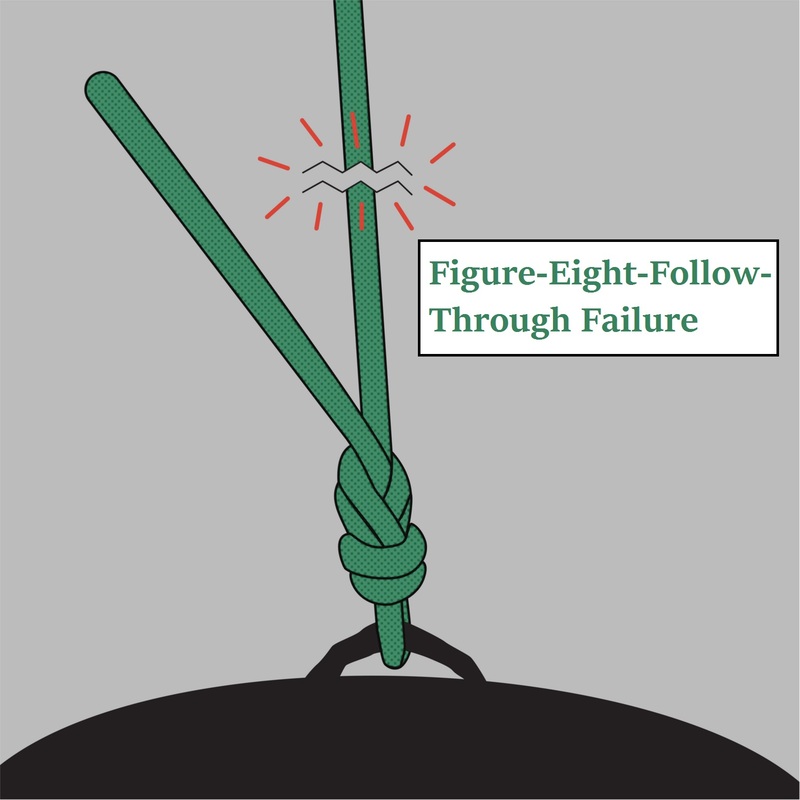 First, let’s address the similar steps of “Climber clips into the figure-eight w/ a biner” (1.5) and “Climber clips the figure-eight into their harness/the anchor” (2.4/3.6). Now, the process itself is similar–you tie a knot and clip a thing to a thing–and therefore adds equal risk. BUT, with Method 1, we’re talking about something that is life-or-death. It’s the knot that you attach yourself to and are lowered on. For Methods 2 and 3, the knot is there to keep you from dropping the rope. Now, if you mess up the knot and drop the rope, that could be bad–someone would have to come get you somehow–but, obviously, the risk of messing up the knot for the Method 1 case is much more directly threatening. If you mess up that knot (or clip the biner wrong), you fall to your death. The second major risk deals with the “Climber clips in direct” steps (1.1/2.1/3.1) that we removed. Once again, the actual physical process adds the same risk in all three cases. You’re at an anchor and you attach yourself to it somehow. BUT, there is a “what if” scenario that is worth mentioning. 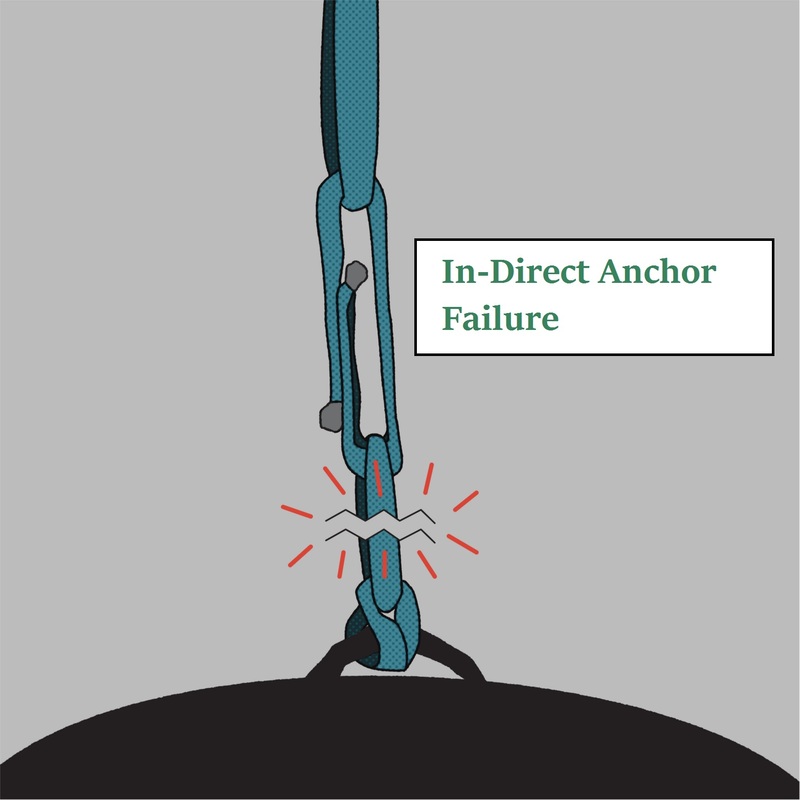 If, during Method 1, your in-direct anchor fails, you would still be on belay and (hopefully) caught by your belayer. So, Methods 2 and 3 have this unique risk. The next two major risks are obvious, and only take place in one method each. This one is when you tie your knot again when lowering with Method 2 (2.7). If you tie your knot wrong, you’ll fall. Pretty straightforward. 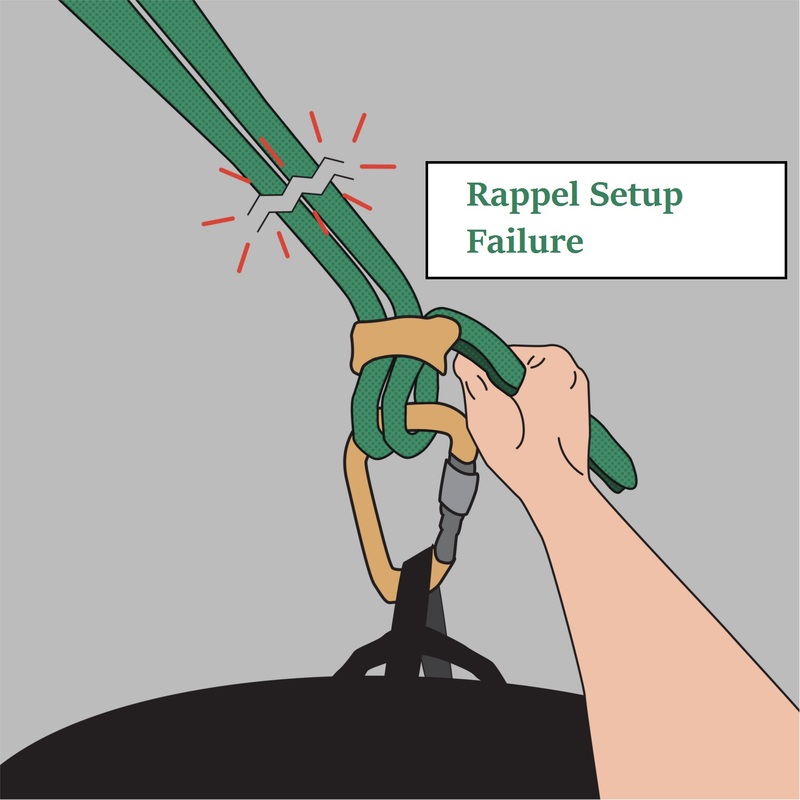 Then, of course, a rappeller could set up their rappel incorrectly (3.10). If you set the rappel up incorrectly, you’ll fall. Lastly, we have a risk that deals with one of the last steps in each method–the actual step of rappelling or being lowered (1.11/2.12/3.13). 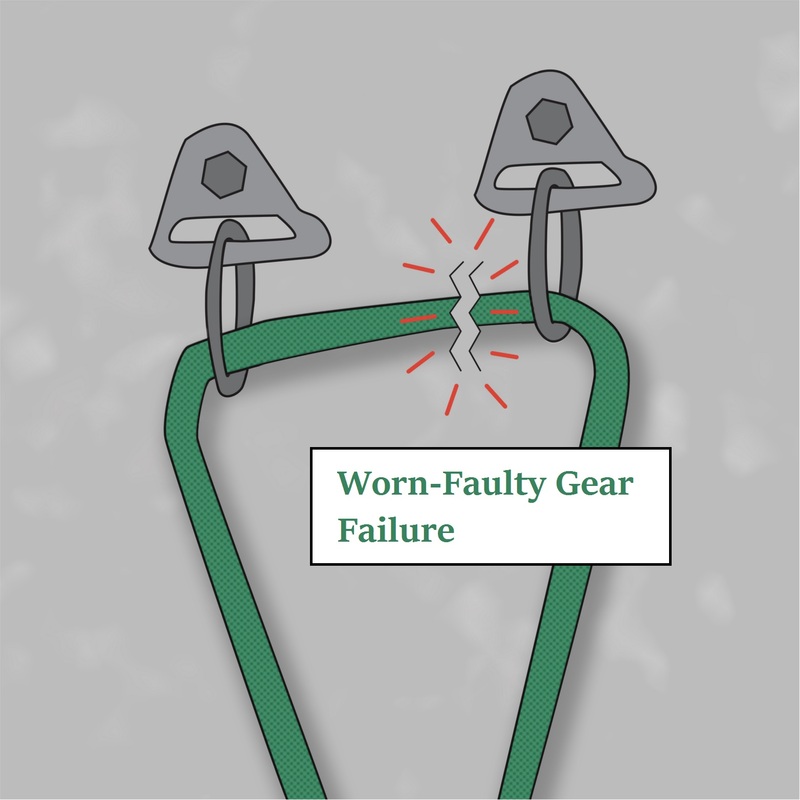 The issue is if the anchor gear or perma-draw biners are worn. In that case, lowering poses a greater risk because of the rope running over the potentially sharp edges vs a static rappel where the rope doesn’t move. Lowering also puts more actual force on the gear than rappelling, which adds to the risk. So, the lowering methods have this unique risk. The next risk involves the voice commands (1.7/1.10/2.8/2.11/3.2/3.11). For rappelling, there is a chance that your belayer could think you’re lowering, and wouldn’t take you off belay–which would be annoying. 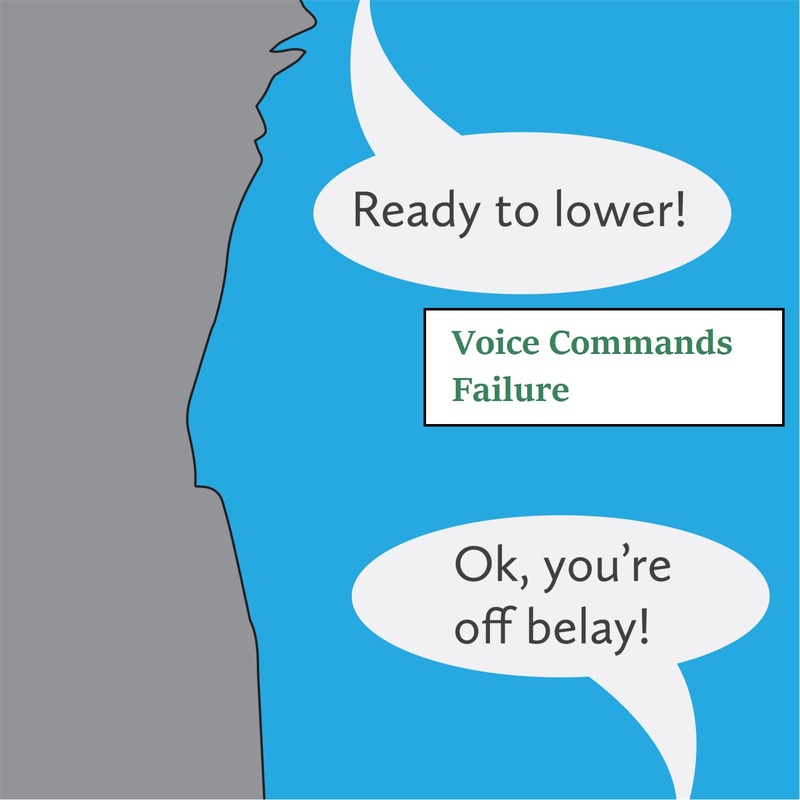 For lowering, there is a chance that your belayer could think you’re rappelling and take you off belay–a potentially fatal error. The distinction here is obvious—voice commands are more dangerous for lowering. So there we have it. That should cover every major risk for each method, unless you can think of something I haven’t. So, here’s the final tally. As far as a quantitative evaluation goes, it’s a pretty close race. Method 2 loses with 4 major risks, Method 1 has 3, and Method 3 has 2. The stickier issue is the qualitative evaluation. For example, a communication issue is much different than a personal ‘I-set-this-up-wrong’ issue. I may attempt to address these later, but for now let’s keep it at that. A few thanks: Thanks to my good friend Cory Livengood for creating the graphics for me. He’s a busy guy so I am incredibly grateful to him for helping me out. My MS Paint graphics would have been ugly! Also thanks to Erica Lineberry, Bob Silk, Maya Kaelberer, Stefan Jeglinski, Bill Webster, and my brother Logan Kennedy for helping me edit, clarify, and summarize the post! It was a beast of an endeavor and their feedback was super helpful in keeping it digestible and unbiased. I hope it’s insightful and helpful. Please comment or email me with any feedback and I’ll keep this thing updated. Cheers! Enjoyed the article. I’m planning to add a similar discussion into my book on Medical Emergency Rescue for Climbers. I think a part of the issue never discussed is that both techniques are vitally important for the development of well rounded climbers and should be practiced in various forms throughout our climbing career. What is the point of climbing other than our development as climbers anyway? Thanks, Todd! Would love for other people to re-analyze what I was looking at to make sure it makes sense, so I look forward to your discussion. I’d agree that both skills are important, you may need one or the other depending on the route or situation. That’s a good point! Thank you for the interesting post. I went climbing at Red River Gorge last weekend. I am a gym climber and this was my first real outdoor climbing experience. Before I went climbing last weekend, I wanted to find out if it’s okay to lower from the anchors without getting yelled at. Strangely enough I found your “Rock Climbing Horror” post and all the debate underneath it. After reading the comments I was encouraged by many who said IT IS OK to lower from the anchors especially when it comes to safety. Sadly I found your counter comments very harsh and defensive. I knew I can lower from the anchors without much problem and that’s what I decided to do. I had a blast in Red River Gorge. I lowered from the anchors (slowly so it won’t wear much) and I felt VERY safe and no one yelled at me. On the other hand, I donated $20 so hopefully they will use it to fix whatever wear and tear I caused. I think for new climbers who do not feel safe rappelling down, they should lower from the anchors. I think it’s easier and less chance of making a mistake. But may be I am saying it because I don’t know how to rappel. I am going to learn better how rappel and when I am comfortable with it, I will definitely rappel down and see how it feels compared to lowering. Also I think climbing sites should post on their websites how they feel about lowering vs rappel. If they have strict rules against lowering, they should put signs and notices. If they think beginners can or should lower from anchors, they should post that too. Put something on the website so people can read it before they visit. I am tired of trying to find out which is ok and which is not then feel guilty. Thanks so much for your comment Badarch. You made a few really important points and I wanted to sit down and address them. I’m a bit torn about the “Rock Climbing Horrors” post. On one hand, it happened and I want to leave it in it’s historical state. On the other hand, I don’t want people to read it and get put off on the sport. Unfortunately, when the comments focused on the rap vs lower thing (a very touchy subject to many people, including me at the time) and people decided to hide behind internet anonymity, it got nasty. That was the entire impetus for this post. So there can be a cut-and-dry, academic-ish discussion on the actual risks/impacts. I think I’ll go add a link to this post in there–maybe that will help solve the problem. The fact that you tried to learn, donated to the RRG, and are willing to give it a shot later means that you are doing the right thing. If someone is new and doesn’t feel safe rappelling, then lower, who cares! Hopefully they’ll learn how to rap and then can decide then based on which method they prefer instead of it being the only option. The point is that that is a thought-out decision instead of just picking one or the other. Hopefully this post helps people think through it some more. You should really mention the need for tying a stopped knot on your rappel. Even if both ends are touching the group, thing can happen, if one rope tangles and doesn’t cleanly go through the belay all forces will be transferred to the second rope which will need to do much more than just touch the ground to avoid you falling. Hey John thanks for the comment. If you pull the rope to the middle, there shouldn’t be an issue, right? There could be, imagine if somehow your rope at the beginning had a knot in it right when you start repelling (unlikely, but a simple mistake could cause this) if the top of the rope was free to move, for every foot of rope you repel down, the other side will be lifted up a foot, by the time you get to the ground you will have half the rope still below your knot, and the other half needs to go all the way up to the anchor and all the way to the ground. Unlikely you will have enough rope, instead unless you have a stopper knot you will fall once you’ve used up the rope. People have died from a lack of stopper knots. Could you not untie the knot while rappelling? This happens a lot if you throw the ropes down and they get tangled. Why risk it. Especially as you could be injured and not able to completely stop your rappel. Does a fireman’s belay not protect you against these dangers anyways? I included that step in the rappelling option.